I really didn't plan to write any more sponsored posts. Even though the handful I have done in the past were 100% my own opinions, about stores or products I actually believe in, I decided that sponsored posts were not worth alienating my wonderful subscriber base. See, it is almost time for my husband's vacation. And anyone who knows me knows what THAT means: the Dreaded HIPY (Home Improvement Project of the Year). Every year since 2006 we have redone a room. And with ten rooms in all, we still have quite a few to go. But the great thing is that we aren't dreading it this year, now that we know what a difference Glidden paint makes not only in the ease of application, but in the quality of the finished product. The first year we converted my daughter's old bedroom into my office. It was our first effort installing a laminate floor ourselves - let's just say it was hard and it took a long time. It wouldn't have been so bad if we had ever painted the room at all in the ten years we had lived here. The walls sucked up so much paint we had to make several trips to Home Depot. First, we needed two or three coats of primer, and then two coats of the latex paint. But considering the mess we had made for ourselves by not maintaining the walls properly, the painting was a breeze. was the highly innovative ceiling paint. The paint comes in a special flat container that is designed for rollers, and it rolls on pink so you can see where you have already painted. I was skeptical about that feature, but it dried white with a great smooth finish. For the walls, I was able to select a color palette that was soothing and would help me stay relaxed while operating my home business from this new office. In 2007, we remodeled the family room. Even though our house is technically a "colonial", our whole first floor is open plan. The only doors that don't lead outside of the house, lead to the bathroom and guest room. Since we had moved from a cramped townhome, we loved the openness, and didn't even mind that our color palette was left over from the mid '80s or that our paint job was never finished. What did they call it again, "Builders' White"? Ahem. Again, we added a laminate floor. On the one hand, it was easier because we knew what we were doing this time. OK, so we were both a year older and found that it was harder to get down on the floor and pound those slats in than it was the year before. But it was the paint that was the real nightmare! A brand of paint that Shall Be Nameless was by far the worst paint that we have ever used. The raffia color we used for three of the walls looked decent enough, but even though we used a tinted primer, the red wall took about six coats and about seven weeks to dry. We started in early November, and were barely finished in time for Christmas. I wish we had the Glidden Paint Testers to touch up that red every time it smeared onto the raffia color, or we found yet another set of brush strokes that revealed the wall underneath. Glidden Paint Testers come with a brush built right into the cap, and would have made it so easy to paint right over those mistakes. They are also much easier to store than messy, half-empty paint cans. Had we used Glidden paint in the first place, I am sure we would not have had so many problems. 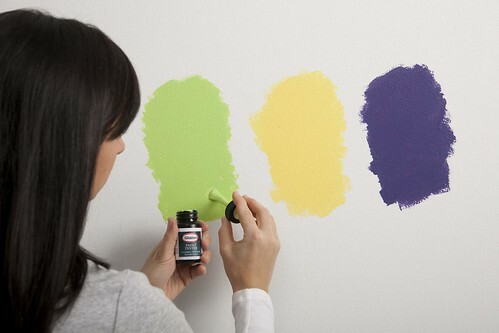 Glidden gives you extra large paint chips, so you can really see what color they are when you get them home under your room's unique lighting. And get this: the paint chips have color suggestions on the other side. That would have made everything so much easier. 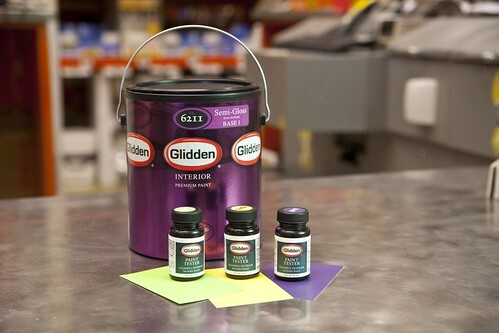 You can even "test drive" various color palettes with the Glidden Room Painter. Just be sure to block out some time. It is so much fun to play around with the colors, that you might come to your senses several hours later. In 2008, I prevailed and we used Glidden paint for our remodel of the living and dining room. In fact, we used the same color that I used in my office. We replaced more carpet with laminate floors, but this time we had sense enough to hire someone to do those. We did the painting, and because of the easy application of the Glidden paint, we were able to finish both rooms in about a week! We even found the perfect wallpaper border that contained all the colors we already had in our room, so we didn't have to buy any new paintings or accessories, or have any furniture reupholstered to work nicely with the new color scheme. A brand new container of ceiling paint covered the ceilings in both rooms and the foyer! I guess you can tell I can't say enough good things about Glidden paint. Now, I will never use anything else. We used Glidden paint to redo the guest room when my daughter moved home last year, and in just a few days will be heading out again to Home Depot to purchase the paint and supplies we will need to paint the kitchen. Only four more rooms to go! Since the likelihood of anyone hearing about anything good happening in Afghanistan is pretty slim, I you might be interested to learn about the valor of a Marine platoon, toiling in an "obscure mountain valley" in Afghanistan. This letter is from the Platoon Commander to the parents of the young Marines serving in 1st Platoon, Golf Company, 2nd Battalion,7th Marines, in Afghanistan in the Summer of 2008. The Platoon Commander is a friend of my daughter's - an exceptional young man we met at a homeschool conference in 2000 and got to know over the next couple of years. He asked some friends to share this account of what happened in the Gullistan Valley, both to honor his Platoon and to encourage us that the war is not everything you hear on the news. As of July 2010, the US Marines have relinquished control of the Gulistan Valley to NATO Forces. Following 1st Platoon’s presence in the summer of 2008, enemy resistance slowly dwindled over the next two years and the villagers still talk about how “The first Marines who came, drove out the Taliban and they never returned.” The District Government is now fully operational and the Afghan National Police are a capable and competent para-military force in control of the valley. Every Marine who passed into the valley in May left in December, alive. Nearly half were decorated for valor. In all, one Silver Star, three Bronze Stars, and numerous Commendation and Achievement Medals for Valor were awarded. Dozens of other acts of bravery will only ever be remembered by those who witnessed them personally. Most importantly, the relationships forged with the local Afghans served to drive a wedge between the Taliban and the people, and the children of the valley will grow up with brighter prospects than their parents. Thus is the legacy of the men of 1st Platoon, Golf Company, 2d Battalion, 7th Marines, and their commitment to an obscure mountain valley in the summer of 2008. Well done, Marines. Semper Fi.